Have you started on your holiday shopping yet? I can't believe that next week is Thanksgiving. It seems like it was just Halloween, and now it will be Thanksgiving. And, once we are done eating turkey, our mind switches to Black Friday and Cyber Monday sales and game plans with friends and family on which stores to hit up for the best deals, and where to shop online. It is going to get crazy. Hopefully you have been finding some great gift ideas with the toys and products I have been sharing the past month and half. You can check them all out over at -- and I will be finishing up my gift guide hopefully by the first week in Dec., to give you time to buy all these great products I was sent to review and share with you, for adults and kids. So stayed tune. Today, though, as we gear up for the first snow fall here in England, I thought I would share some new and upcoming releases from Mill Creek Entertainment, that would make for great stocking stuffer ideas for movie and TV show fans. Many of these new releases are the complete series, so you can binge watch some of your favorite shows all over again, or spend the winter catching up episodes you have missed or fall in love with a series that has already aired and you missed. I, for one, am going to be spending tonight starting to watch Rescue Me, which I missed when it first aired on television, and have had on my radar to watch once the whole series was available to own DVD. It will be a nice way to end the day, as the snow falls outside, and I watch this much talked about NY City firehouse post 9/11. "They save us, but who saves them? Starring: Denis Leary (The Amazing Spider-Man), Andrea Roth (Netflix’s 13 Reasons Why), Daniel Sunjata (ABC’s Notorious), Callie Thorne (USA’s Necessary Roughness), Steven Pasquale (CBS’s Doubt)"
We plan to start watch this series tonight, but already spent the past couple days watching the bonus features first, minus the deleted/edited scenes as we wanted to hold off on these until we watched the complete series, so there were no spoilers, and we knew what was going on. I really liked watching the behind the scenes featurettes, as well as the Firehouse part where we got to hear real stories from brave firefighters. I am a huge Denis Leary fan, and love his comedy, so am excited to see him step into the role of a firefighter in this drama series, which still has fans from the series still talking about it. 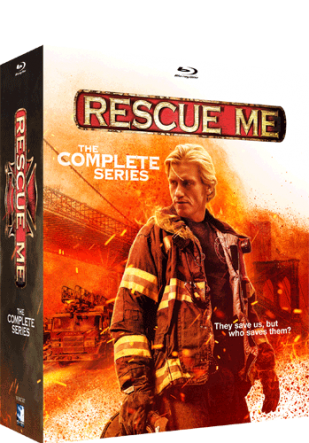 If you loved Rescue Me and didn't miss an episode, but want to relive the series all over again...or, you are like me and caught a few episodes, but had been holding off on watching more until the complete series was available, well now is your chance to own this DVD set, available now from Mill Creek Entertainment. It would make for a great stocking stuffer, or gift under the tree, for sure! "Yesterday's history. Tomorrow's the future. Tonight's the party. It's graduation day at Huntington Hills High - a time for pomp and circumstance, tassels and mortarboards, and serious introspection about the future. But tonight, the seniors will leave all that behind for the things that really matter - romance, revenge and rock 'n' roll. Starring: Jennifer Love Hewitt, Seth Green, Ethan Embry, Charlie Korsmo, Peter Facinelli and Lauren Ambrose. Special appearances by: Jaime Pressly, Selma Blair, Jerry O’Connell, Jenna Elfman, Jason Segel, Freddy Rodriguez, Sean Patrick Thomas, Clea DuVall, Melissa Joan Hart, Breckin Meyer, Donald Faison and more!" Special 20th Anniversary Release on Blu-ray! All-Star Cast – a Who’s Who of current A-List Hollywood Celebs! First, let me start by saying how old I feel knowing that this is a 20th year reunion edition Blu-ray disc. It feels like yesterday that this movie released, and I saw in theaters with my friends. But, I guess I am old...and if you loved this movie when it first released, then you are, too! :-) Not only can you relive the laughs of this house party comedy, but the Blu-ray released by Mill Creek Entertainment has bonus features you will love. You get to watch deleted scenes, watch over and over again until it is stuck in your head, the "I Can't Get Enough you Baby" music video by Smash Mouth, as well as enjoy the Huntington Hill Class of '98 Reunion special, which was my personal favorite of the bonus content. I was surprised to find that my husband never saw this movie, so we had to change that this past weekend. During our in-house date night, we watched this movie, and we both couldn't stop laughing. Even though I have seen this movie several times over the years when it aired on television, it was still enjoyable watching it again, especially with my husband who was watching it for the first time. He liked seeing how far many of the cast has come celebrity wise, and all the work they have done since this teen movie. If you loved this movie 20 years ago, then you will want to pick up this special anniversary Blu-ray edition to watch again, while also checking out all the great bonus features. This is a must have for "Can't Hardly Wait" fans, young and old. "Community is a smart, exuberant comedy that was consistently ranked as one of the most inventive and original half hours on television. 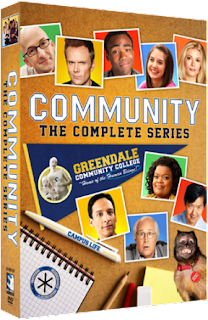 This ensemble comedy centers on a tight-knit group of friends who all met at what is possibly the world's worst educational institution -Greendale Community College. “Community is mercilessly snarky and also surprisingly charming" - Alessandra Stanley, The New York Times"
I wish my college years were like the Community television series, as they would have been more fun, especially if Joel McHale's character was in my group of friends. Were you a fan of Community? If so, you will be able to hear that you can get the complete series on either Blu-ray or DVD from Mill Creek Entertainment. In addition to all the episodes you also get to enjoy over 3 hours of behind-the-scenes featurettes with cast and crew, as well as gag reel and deleted and extended scenes. I have only had the DVD set for about a week, but my husband and I already done watching all the bonus features -- the gag reel was a hoot, and one we had to watch a couple times. With over 110 episodes that spanned 6 seasons, we are going to be busy watching this and the Rescue Me series this winter. Benji has never been more lovable than in this magical musical holiday special. A surprise visit to meet Kris Kringle (Oscar® nominee Ron Moody) finds the jolly old elf with a secret that could break the hearts of millions of kids. He’s planning to take the night off on Christmas Eve! And there’s only one who can melt his heart and change his mind. Starring: Ron Moody (Oliver), Patsy Garrett (Benji), Cynthia Smith (For the Love of Benji), Deep Roy (Charlie and the Chocolate Factory)." I was excited when the folks at Mill Creek Entertainment sent along the cult-classic special holiday movie, Joe Camp's Benji's Very Own Christmas Story, for my family to review/watch. I only recall seeing this movie once when I was little, so when we sat to watch it again this past Friday for our weekly family movie night, it was almost brand-new to me. I recalled bits and pieces of it, and by the end we all agreed that this is a must wrap movie for our upcoming "12 Days of Holiday Movies" advent we do, where we wrap up 12 our of favorite holiday movies (new and past releases), and watch as we count down until Santa's arrival. We do this in addition to a book advent, and these two traditions we started a couple years back, are so much fun and really get us all into the holiday spirit, while also giving me an excuse to snuggle up on the couch with the whole family as we read holiday books and then watch a nightly holiday movie. This would make for a great movie to watch as you start planning your holiday decorating, if you haven't put up your tree yet, or if you are looking for a fun family-friendly movie to enjoy with the whole family. I am even considering putting this movie on when my parents come to visit for Thanksgiving, so that we can all watch again. When I told my Mom I had received this new release, she was happy as this is one of her favorite holiday movies to watch, and she hasn't seen in years. So, it would be a nice surprise after a great family dinner together. Benji fans young and old will go crazy for this holiday story, which features none other than the "real" Kris Kringle (AKA Santa, Father Christmas, etc.). Based on Lily Koppel's book The Astronaut Wives Club: A True Story, this limited series tells the story of the women who were essential players behind big events in American history. As America's astronauts were launched on death-defying missions, the lives of their young wives were transformed from military spouses to American royalty. As their celebrity rose, and tragedy began to touch their lives, they rallied together. Featuring: JoAnna Garcia Swisher (ABC’s Once Upon a Time), Yvonne Strahovski (Hulu’s The Handmaid’s Tale), Zoe Boyle, Dominique McElligott, Odette Annable (TV’s Pure Genius), Erin Cummings"
I don't know about you, but I love reading a book and then comparing it to a movie. One of my favorite books has been Lily Koppel's book, the Astronaut Wives Club: A True Story, I couldn't wait to watch the television series which aired back in 2015. And now, 3 years later, I am getting to watch this series again with my youngest daughter, who has turned into a historical buff, and loves to watch and learn about famous women in history. 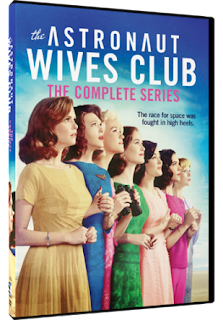 This DVD, which includes all 10 episodes of the 2015 limited series was a great introduction to the Astronaut's Wives Club to her. I don't remember ever learning about these women who were essential players in American history when in grade or high school, but want to make sure my two girls, whom I homeschool know about them, and how these and other women left a mark in history, even if they are not usually talked about in textbooks. It is nice to see movies and television series like these being released to help empower young women and show them that women can make a difference in history and as a reminder to dream big. This is definitely one series will be watching again and again...and so happy I have the complete series all on one DVD, for convenience. Did you find any DVD/Blu-rays that caught your eye and would make someone on your holiday shopping list smile when they unwrap this holiday season? Or, maybe you found some of your favorite shows and movies that you want to own, so that you can watch time and again, or catch up on missed episodes. 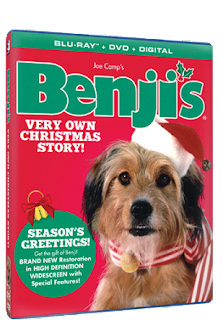 I personally recommend the Benji holiday classic if you are looking for a new holiday film to add to your family's growing DVD collection. My girls really enjoyed it, and it will be a movie we will be looking forward to watching each year the holidays roll around. To learn more about this and other great DVD and Blu-ray releases for kids, adults and families to enjoy, head on over to https://www.millcreekent.com/ today.